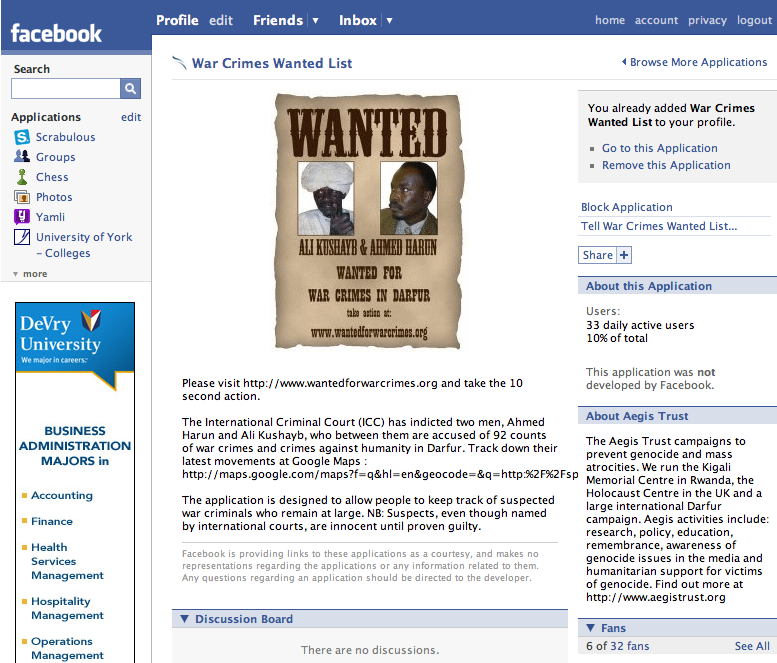 Netting War Criminals using Web 2.0? 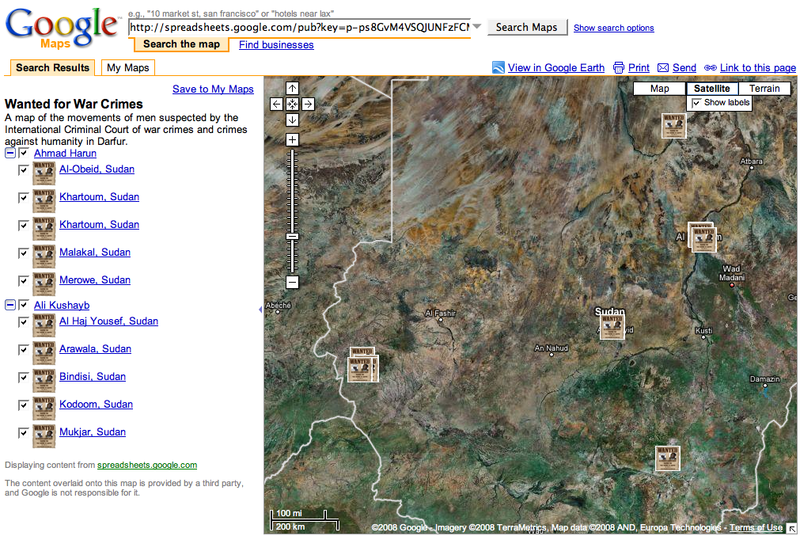 The Aegis Trust in London has turned to Facebook and Google Maps/Earth to track the movements of Sudanese Government Minister Ahmad Harun and Janjaweed leader Ali Kushayb. The two are charged by the International Criminal Court (ICC) with organizing the destruction of Darfur’s town during which more than 100 civilians were murdered, and women and girls raped. Some 34,000 people were forced to flee in the mayhem which also saw the destruction of food stores and the mosque. Could this be the beginnings of Michele Foucault’s Panopticon albeit reversed? The panopticon is a prison structure originally designed by Jeremy Bentham in which well-lit prison cells surround a central watchtower. Guards can monitor any prisoner’s activities without the latter knowing they are being watched. Foucault uses Bentham’s panopticon as a metaphor for power dynamics in society more generally. However, the information revolution potentially challenges this metaphor, allowing the multitude to observe elites. While the predominant feature of the information society in the West is the spread of the Internet this is not the case for the majority of developing countries with repressive regimes. Indeed, mobile phones are the most widely spread ICT in developing countries and also the technology of choice for activist networks in these regions. To this end, I hope the Aegis Trust will include SMS text messaging as a way to report sightings of individuals charged with crimes against humanity. This entry was posted in Digital Activism, Social Media and tagged Cyberactivism, Facebook, Google. Bookmark the permalink. Interesting. The problem is that Facebook is not used much in Sudan except by a handful of expats, and the Map/Earth component is just for presentation (not a tracking tool). He is not likely to leave Sudan while wanted by the ICC, so who would actually be able to track him? I don’t think that’s the point of this project- I think the purpose and benefit to Aegis is the media hype itself- anything to bring attention to the organization and two wanted war criminals. To actually work, the campaign would have to use text messaging as you suggest and recruit Sudanese and expats. I think functionally their model might actually work for something like ‘amber alerts’ or as an extension of America’s Most Wanted, in countries where Facebook’s networks are robust.